Last week, I posted an audio recording of Yahoo CEO Scott Thompson, from a radio interview he did in early 2009, in which he did not deny he had a computer science degree when the host of the show stated it as a fact as a key part of her question. Thompson did not have such an academic credential. The host of Tech Nation, Moira Gunn, sat down with me yesterday to further explain in the video interview below why she asked the question that particular way of Thompson. In the video and in emails to me, Gunn firmly asserts that she did so because Thompson and she had a conversation about their CS degrees leading up to the interview and also kibitzed about the importance of such an education in the pre-roll of the interview. 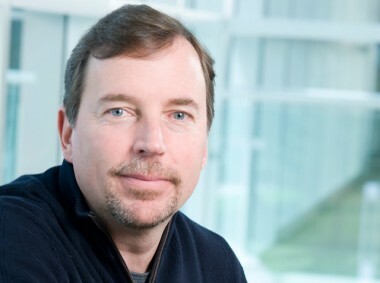 At the time of the interview, Thompson was president of eBay’s PayPal payments unit and was there to talk about its growth. At the end of the largely charming interview, Moira Gunn asked him a direct question about his college degrees, specifically noting they were in accounting and computer science. “Yeah,” begins Thompson, failing to correct her at all on the fact that he does not actually have a computer science degree — only one in accounting. He then went even further, touting his early tech training at Stonehill College, near Boston, which did not offer a computer science degree and had only one basic computer course at the time he went there, from 1975 to 1979. “And that’s really the background that I have, and it started back in my college days, and I think that’s really the wonderful part of being an engineer is you think that way,” said Thompson. In the most generous interpretation, it’s not quite clear whether Thompson was saying “Yeah” to her statement of his academic credentials, or if he was not actually listening. But it’s a careless oversight on his part not to have corrected her about the degrees, which could also be said about a computer science degree being present on his bio for more than a half-dozen years at eBay and later at Yahoo without some notice by him. Because while Thompson has had a long career as a tech exec, as well as a stint as a CIO, academically speaking, a computer science degree did not happen in his college days nor did he graduate as an engineer. While it is entirely possible that Thompson did not correctly grok what Gunn was saying, it seems pretty clear that he implied his college background was in tech and he was an engineer. It is true that Thompson did take some computer science classes at Stonehill. And it is entirely possible that he thinks of himself as an engineer by work training and not by college degree. But Gunn claims that Thompson put himself out to her in the time before and during the interview as someone who did have such a degree and never corrected her assumption about that or her direct statement about it. My recollection is that they sent me some talking points (they had a message they wanted to get out) and a bio — I always insist on an official bio from the PR folks — the PR folks would have booked him. I didn’t seek him out — they approached me — I would have gotten it from them. I would have done more research, but likely not confirming his degrees. I could swear I talked to him about the bachelors in CS before we did the interview. Maybe in the elevator before the tape rolled — you see, *I* have a bachelors in computer science. I thought it was opportune and important. I always mention it to people who have the same degrees I have or went to the same schools. I would have thought it was important. (I have a bachelors in CS, a masters in CS and a PhD in mechanical engineering). I mentioned it to the google boys when they first came in 2001, and everyone before and everyone since — whether it enters the interview or not. In this case, it was sufficiently important that I had it in my written interview questions — it was not an afterthought. As a professor in a business school — who has also taught in computer science — I knew it was highly unusual to have someone with degrees in both accounting and computer science. Typically, these are two very different kinds of people — it would be a very unusual credential to have, and I immediately noticed it. I’m always a stickler about a person’s biography — here’s from my “Media Information” section on technation.com. I’ve been doing this for 20 years, and it’s always relevant — especially in tech and science. It affects perspective, insight, depth of understanding, basic skills, etc. I also want to know what *they* say is relevant in the person’s official biography. Yahoo confirmed last week that it included inaccurate information about Thompson’s academic background on its Web site and in its regulatory filings. The admission came after activist shareholder Dan Loeb of Third Point correctly asserted that Thompson’s resume was overstated related to his education. Yahoo first called the inclusion of the computer science degree on his bio an “inadvertent error,” but has given no other explanation as yet. Later, the Yahoo board said it was reviewing the matter and would then make appropriate disclosures afterward. There is now an official board probe taking place. I sent the Gunn email quotes, which are similar to the video interview I did, to a Yahoo spokeswoman. She declined comment. Here’s Gunn talking about the circumstances of her interview with Thompson, as well as the new audio segment of them talking about computer science education, which she said flowed out of an earlier non-recorded bonding over their CS degrees. I also included the part in the actual interview where he does not deny her assertion that he had a CS degree.